Looking for an easy and festive Christmas candy? 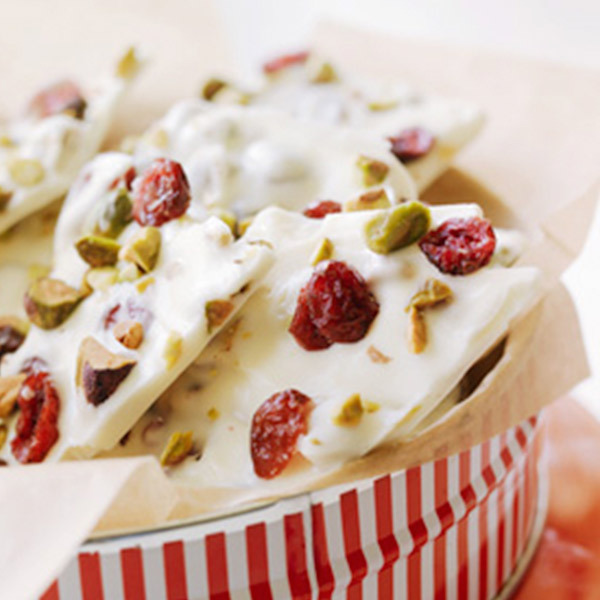 This White Chocolate Bark recipe has only three simple steps. You melt white chocolate baking chips, stir in the pistachios and dried cranberries and break the mixture into pieces after it hardens. The white chocolate and the red cranberries add the classic Christmas colors to any dessert tray. Line a baking sheet with foil. In a bowl, combine the pistachios and cranberries. Measure out half the mixture and set aside. In a bowl set over hot, not boiling, water, melt the chocolate chips. Remove from the heat, and stir in the pistachio-and-cranberry mixture. Spread the mixture evenly over the baking sheet. Sprinkle the reserved pistachios and cranberries over the chocolate and use a spatula to gently press them in. Refrigerate for 30 minutes or until hardened. Break into uneven pieces.